It’s Awards Season In Commercial Real Estate! Its awards season in our industry! Between three different organizations, (SIOR, CoStar, and CCIM) Investors Realty had nine different brokers recognized for their achievements in 2018. We are very proud of our team and appreciate all their hard work and dedication. It’s nice to know that their work hasn’t gone unnoticed! CoStar Power Brokers use a unique methodology to determine who they give their individual awards to. In the Omaha/Council Bluffs market, there are two top leasing brokers selected for the office, retail and industrial sectors and two brokers selected as top sales brokers. J.P. Raynor was honored as a Top Leasing Broker in the office sector and R.J. Neary was a top sales broker. 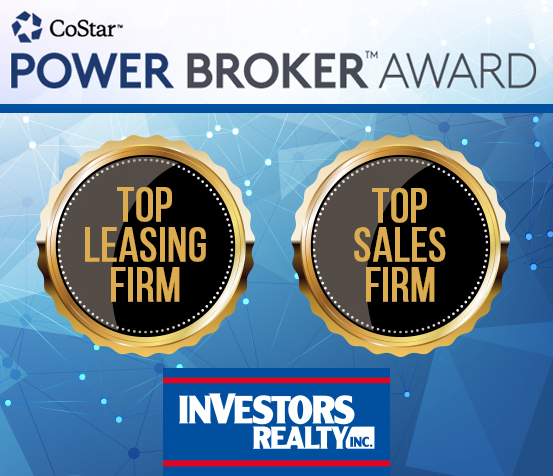 Investors Realty, Inc. was the ONLY company in our market that was listed as both a Top Leasing Firm as well as a Top Sales Firm! “These awards are a testament to the skill and organization of the people at our firm” says marketing director Andy Steingas. For the full list of winners 2018 CoStar Power Brokers in our market, look here. On a different stage in March, Investors Realty won three of the six CCIM Big Deal awards awarded by the Nebraska CCIM chapter. Ember Grummons was recognized for two CCIM Big Deals and three honorable mentions. Ember won in the Retail category for his $7.37M sale of the Legacy Village retail center near 175th and Center Street and in the Office category for his $22.4M sale of two buildings in North Park just off 120th & Blondo Street. At Legacy Village, Ember represented the seller where the property closed at 94% of asking price despite losing a tenant who was expected to renew. The purchaser assumed the existing life company loan. The loan assumption and closing was completed 52 days after purchase and the sale agreement execution. Ember helped the seller of this property exchange into one of a different listing that Ember had. At North Park, Ember represented the seller and received multiple offers from qualified bidders. The price exceeded the seller’s expectations and the sale closed at 99.6% of the contract price. The capitalization rate was almost 200 basis points lower than the sale of two adjacent identical buildings 18 months earlier. The BIG Deal for Land went to Tim Kerrigan for his work on the southwest corner of 222nd & F Street where he represented the buyer of 273 acres of land at a purchase price of $5.5M. Tim Kerrigan was also recognized for six honorable mentions transactions in a few different categories. R.J. Neary and Ryan Zabrowski were both awarded an Office and Industrial Honorable Mention. John Heine was honored an Industrial and Multifamily Honorable Mention. Lee Ehlers was given an Honorable Mention in the Industrial category for his $3.2M deal of 49,120 sf at 98th & J Street. The full list of winners and honorable mentions from this event is available as a pdf here. At the beginning of March, Investors Realty brokers saw great success with Top Transaction Awards given out by Society of Industrial and Office Realtors (SIOR) which represents the world’s elite in industrial and office brokerage. R.J. Neary and Ryan Zabrowski had the 18th largest industrial deal by an SIOR member in the nation and the 38th largest in the office sector. They represented the owner a 650,000 sq. ft. industrial building at 125th & I Street and represented the buyer of 97,204 sq. ft. at 19th & Douglas Street. Tim Kerrigan and Steve Farrell had the 20th largest SIOR deal in the nation in the office sector with their 154,029 sq. ft. sale to Children’s Hospital at 85th & Dodge. 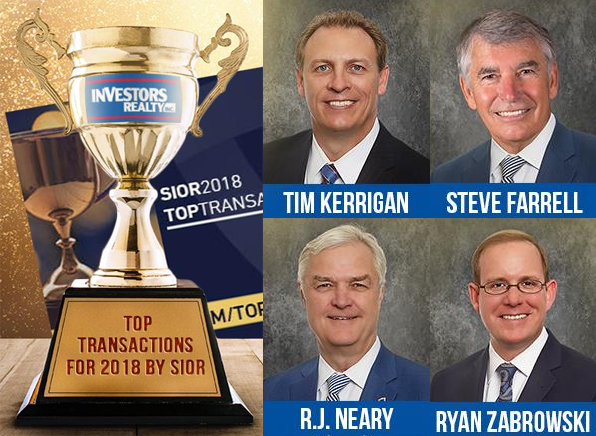 You can get more information about the SIOR Top Transaction Awards and to see the full list of winners here.